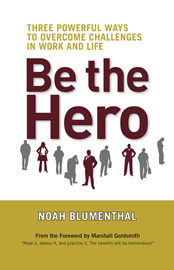 This book, says author Noah Blumenthal, is about helping you choose to be an everyday hero. And, Blumenthal has written this book as a parable with a very “everyday” kind of guy, called Jeff, whose life and work throw him some unexpected challenges. With a little help from friends and co-workers, Jeff learns how to examine his situation from other perspectives – to tell the stories from the point of view of how a hero would see them. Not surprisingly, he finds when he practices being a hero instead of a victim, he is able to resolve many of his problems. Like many books that tell inspirational stories, things can become a little to saccharine at times. However, I also found myself thinking about how I would change my views about certain people and events in my life by employing some of Blumenthal’s techniques. Not a bad way to spend a couple hours. For more information, or to order the book, visit www.bkconnection.com and watch a short inspirational video.